It’s currently Monsoon season in Hong Kong, a time that produces only 100 hours of sunshine a month and huge rainfalls. Or, as Ogilvy & Mathers and Cebu Pacific Airlines saw it, an opportunity to promote their airline and the Philippines. 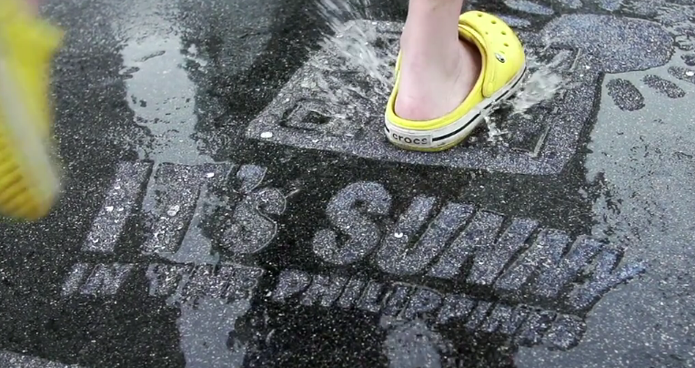 By creating “rain-codes”, the ad agency sprayed a line “It’s sunny in the Philippines” and a QR Code linking to travel discounts in waterproof paint, appearing only when wet. The agency itself claims a 37% boost in online bookings, however any claims directly from the agency should be taken with a big grain of salt. Their second proof point, “we got a little more attention” is much more accurate and really, a perfectly valid outcome for such a campaign. In a crowded advertising landscape, the campaign put forth something a little different, a little unexpected, a little whimsical and got them a little more attention. The idea really suits the airline as a brand — one that is fairly well known for gimmicks and fun — including its slogan ‘why every Juan flies’ and flight attendants dancing along to Lady Gaga and Katy Perry during safety demonstrations. Admittedly, I would be less inclined to recount a stunning rendition of ‘California Gurls’ during an emergency landing than I would get my lifejacket on and brace for impact, but it is still worth applauding the airline and ad agency for bringing a little character to the budget airline game. The real lesson in all of this, however, is that a smart brand gesture and advertising campaign doesn’t always require a big spend. What is required is some creative thinking, understanding the brand and market and an intelligent execution. Seems like a simple formula, but then most “why didn’t I think of that” moments are. For us in agency world, the reality is, the more we work closely with a brand and the better we know it, the more frequently these ideas manifest. It’s why we always want to build long term relationships with our clients, so we can all reap the rewards. One small idea can change everything! Agree with Tim, a great example of how a good idea can take control of the media, rather than trying to buy your way in. More power to guerrilla-marketeers.